6mm Liteglaze is a UV resistant clear Acrylic glazing sheet that is safer and stronger than glass. It has good optical clarity and excellent weatherability and is suitable for both interior and exterior applications. Carefully score the sheet until nearly halfway through and right up to the edges, using a cutting knife with a scoring blade, against a firm straight edge, clamping the sheet to avoid slipping. It is best to score the sheet on a firm flat surface. Place the sheet on a firm table, with the scored cutting line upwards and along the edge of the table, then apply even pressure downwards to break the sheet along the scored line. When breaking the sheet support all the sheet fully along the scored line. If any irregularities occur, they can be smoothed with an emery board or filing plane. N.B. It will not be possible to cut Corotherm Flat using this method. See sawing guidelines below. Ariel Glazing Sheets can be sawn, either singly or several sheets together. Use an electric jigsaw or a handsaw with a fine toothed blade at a shallow angle. 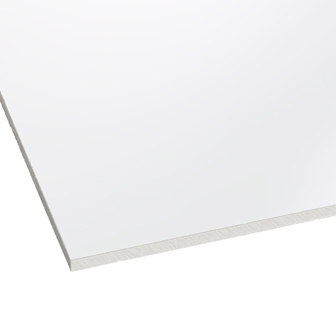 Sawing is better than cutting and dividing if just a thin strip needs to be removed from a sheet. For cutting curves, use an electric jigsaw which has a scrolling feature. When using a jigsaw set the pendulum stroke to zero and when cutting curves always ensure the sheet is fully supported. Slow speed power drills or hand drills are both suitable for drilling Glazing Sheets and should be used with a metal working bit. Prevent the drill point from skipping by marking the hole position with a bradawl or by applying a small piece of adhesive tap where the hole is to be made. Use light pressure and back the sheet with a piece of wood to help prevent the sheet from chipping where the drill bit emerges. Make holes 3mm large than fixings to allow for thermal movement. Ariel Glazing Sheet can be fixed using suitable proprietary fasteners, jointing strips, adhesives and sealants. Leave 3mm clearance around the edges of the panels to allow for thermal movement. Do not remove the protective film until the piece is ready to be fitted. Corotherm Flat can be installed in most types of frames including PVC, wood and aluminium. The framing system must retain the sheet but allow for thermal movement. Only compatible sealants must be used, these include silicone, EPDM, neoprene or ‘plasticiser free’ chloroprene materials of proven performance. Please note that PVC gaskets are not suitable for use with polycarbonate. Use anti-static cleaner or warm soapy water to clean. DO NOT use glass cleaner, abrasives or squeegees.